Caroline and William Herschel. Lithograph 1896. Courtesy Wikimedia Commons. Born in Hanover, Germany, Caroline Herschel gave up on getting married after a bout with typhus left her growth stunted seriously. She was well-educated beyond traditional women's work, and trained as a singer, but she choose to move to England to join her brother, William Herschel, then an orchestra leader with a hobby in astronomy. In England Caroline Herschel began assisting William with his astronomical work, while she trained to become a professional singer, and began to appear as a soloist. 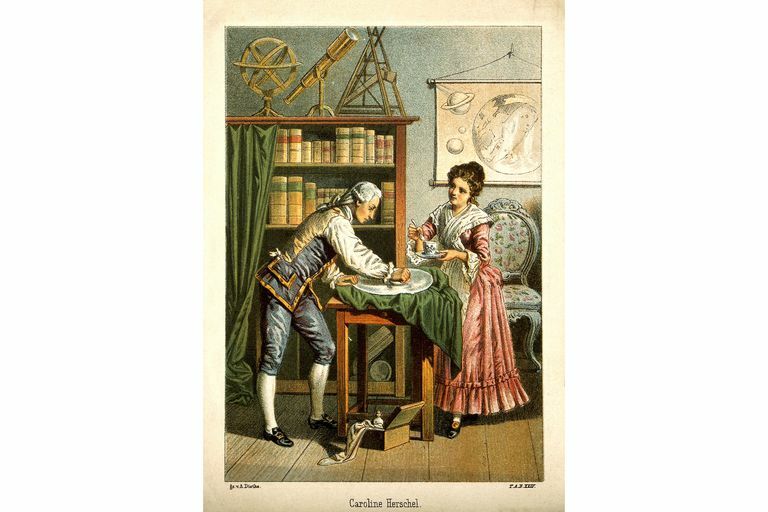 She also learned mathematics from William, and began helping him with his astronomy work, including grinding and polishing mirrors, and copying his records. Her brother William discovered the planet Uranus, and credited Caroline for her help in this discovery. After this discovery, King George III appointed William as court astronomer, with a paid stipend. Caroline Herschel abandoned her singing career for astronomy. She helped her brother with calculations and paperwork, and also made her own observations. Caroline Herschel discovered new nebulae in 1783: Andromeda and Cetus and later that year, 14 more nebulae. With a new telescope, a gift from her brother, she then discovered a comet, making her the first woman known to have done so. She went on to discover seven more comets. King George III heard of her discoveries and added a stipend of 50 pounds annually, paid to Caroline. She thus became the first woman in England with a paid government appointment. William married in 1788, and though Caroline at first was skeptical of having a place in the new home, she and her sister-in-law became friends, and Caroline had more time for astronomy with another woman in the house to do the domestic chores. She later published her own work cataloguing stars and nebulae. She indexed and organized a catalogue by John Flamsteed, and she worked with John Herschel, William's son, to publish a catalog of nebulae. After Willliam's death in 1822, Caroline had to return to Germany, where she continued writing. She was recognized for her contributions by the King of Prussia when she was 96, and Caroline Herschel died at 97. Caroline Herschel was, along with Mary Somerville, appointed to honorary membership in the Royal Society in 1835, the first women to be so honored. Maria Mitchell: First Professional Woman Astronomer in the U.S.